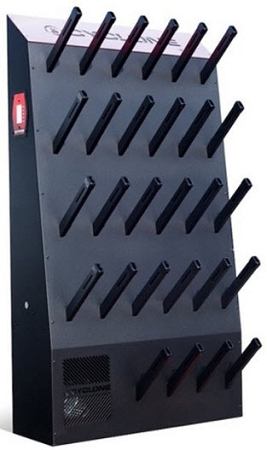 The 14 pair Cyclone ski boot dryer is the largest unit using a standard plug for 110volt operation. This larger residential unit allow 14 pairs of boot and/or gloves to be dried within 45 to 60 minutes. Easily mounts to the wall with a bracket attached to your wall studs and used very little floor space. Designed for larger homes or smaller rental shops. New motor design runs efficiently and very quiet. The Cyclone Boot Dryer produces 350 cubic feet of 95 - 105° F air per minute per pair of boots, allowing complete drying of 14 pair in about 30 minutes. The design of the new motor, efficient heater element and custom cabinet maximizes air pressure, heat and volume for the most effective drying of your outdoor gear. 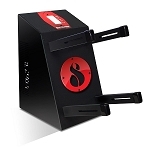 Programmable timer allows you to choose the correct drying time. * Estimated shipping cost $235.00. This model ships on a pallet via. a LTL truck. The ship cost my vary depending on shipping address, residential delivery, lift gate truck, etc. If there are any adjustments to the ship cost we will notify you before completing the order for your approval.